Passover ends tonight after sundown and Jews of Moroccan heritage will begin to celebrate Mimouna, a delightful folk holiday that honors (depending what source you read) the birth or death of Maimon, father of Rambam (a revered scholar and rabbi), the parting of the Red Sea during the Exodus from Egypt or just the neighborliness and support that once existed between the Muslim and Jewish communities in Morocco. The holiday lasts until tomorrow night. Historically, on Mimouna the Jews of Morocco and their Muslim neighbors would exchange food baskets, including gifts of flour and yeast to replenish the Jews’ pantries. Open houses with tables groaning with sweets awaited revelers. Picnics and parties continued the next day. As these Jews immigrated to other parts of the world, they brought Mimouna traditions with them, especially to Israel. Aliza Harari is a teacher at the Jewish Community High School in San Francisco and an Israeli of Moroccan descent. Harari says another specialty of the holiday is preserves, especially vegetable-based ones. Her favorite is eggplant jam. 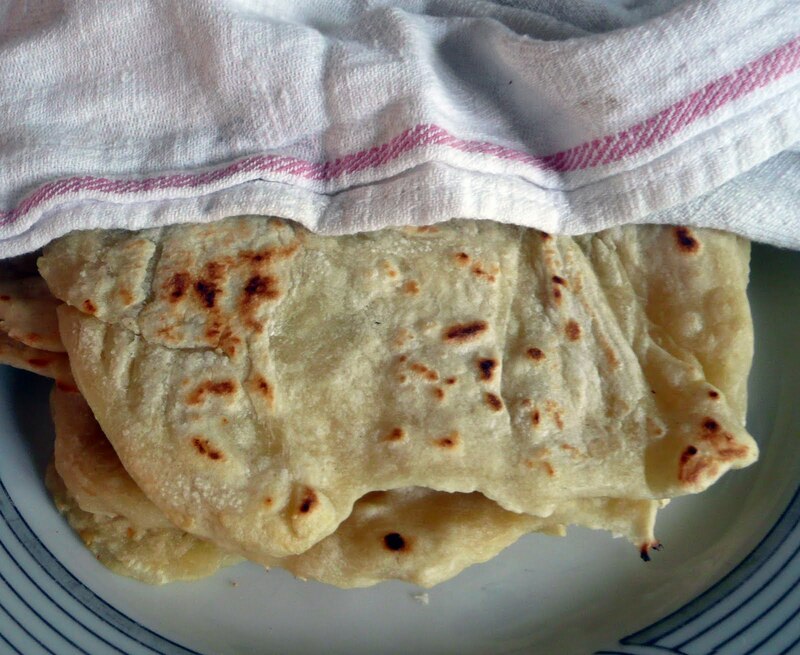 Mufleta is a chewy, pancake-like bread. Spread with honey and butter or try with Honey Butter Caramel Sauce or Eggplant-Tomato Conserve. Put a tablespoon or two of either in the middle, roll up and eat. Crepes or flatbreads are good substitutes. Stir flour and salt together in large bowl. Add water, mixing until dough comes together. Add additional flour or water as needed until smooth and not sticky. Knead by hand a minute. Cover. Let rest 10 minutes. Pour ¼ cup oil onto a plate. Form dough into 1½” balls. Roll in oil. Lightly grease small fry pan and heat over medium high heat. Grease work surface. Using fingers or rolling pin flatten a ball and stretch into thin 6” circle. Fry 2-3 minutes on each side in heated pan until cooked and lightly browned. Set aside. Cover to keep warm. Repeat. Serve immediately. Melt butter in saucepan over low heat; add honey and cream, whisking constantly until blended. Raise heat to low medium and, still whisking, cook for 20 minutes until thick and syrupy. Cool to room temperature (it will continue to thicken). Gently reheat if desired. Toss the eggplant with ¼ cup salt and put in colander. After 30 minutes, rinse well, drain and blot dry. Heat 3 Tbs. oil in large fry pan. Sauté onion over low heat 15 minutes until soft and brown. Remove from pan. Heat 2 Tbs. oil over medium high heat. Add eggplant. Sauté until lightly browned. Add onions, zest, juice, tomatoes with liquid, red pepper, black pepper, cinnamon and honey. Simmer over low heat, stirring occasionally. Taste. Add ¼ tsp. salt if needed. Cook until eggplant is soft and mixture is very thick. Correct seasonings, adding more lemon juice or honey as needed to get a more sweet than sour taste. This post is adapted from the article I wrote for the j. weekly. You can read the original article here. About the photo: A stack of mufletas awaiting their fate. i usually have a pizza based feast on the lunch after passover ends :) sometimes fried dough drizzled with honey as well :) Including the pancakes and that amazing honey butter caramel sauce this time around. Thanks for sharing! Sadly, Ms. Harari, my son's high school Hebrew teacher and advocate/friend, passed away from lukemia just a few months after this post. She was a wonderful, warm, giving woman and will be sorely missed by her family, friends and students. She always wanted me to borrow her Israeli cookbooks and I kept having to tell her I couldn't read Hebrew to which she tell me, never mind she'd translate whatever I wanted to know. I never took her up on her offer but was grateful we got to talk about her Mimouna memories which led to this column.